International expert organization DEKRA extends its testing facilities with the opening of a new laboratory in Sterling, Virginia (USA). Doubling its lab space, DEKRA is ready for the increased demand in safety and connectivity testing for the Internet of Things. Manufacturers who aim to market their products globally need to comply with stringent requirements around wireless, electromagnetic compatibility and radio frequency. Aware of this challenge, DEKRA has invested in a new regulatory testing facility in Sterling, Virginia with, amongst others, a state of the art semi anechoic chamber. The new lab allows DEKRA to perform wireless and cellular testing as well as A2LA (American Association for Laboratory Accreditation) accredited EMC and RF testing for manufacturers who wish to export their products to North-America. The company has also doubled its lab space to prepare for the demand in safety and connectivity testing that the Internet of Things is creating. The EMC and RF lab scope covers US, Canadian and European regulations and sectors such as i.a. automotive, medical devices and wireless products. This leads to an even more comprehensive range of testing services for DEKRA's customers, together with the company's services in international type approvals, safety testing and certification, cyber security evaluations and certification, and wireless and cellular. 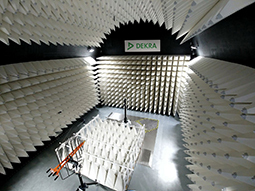 DEKRA provides testing and certification for EMC and Radio equipment as a Notified Body under the European Electromagnetic Compatibility Directive 2014/30/EU and Radio Equipment Directive (RED) 2014/53/EU and as a Telecommunication Certification Body (TCB) for the US market and ISED (Canada). Through a global network of labs, DEKRA helps customers gain access to the EU, the US, Asia and other markets. Do you want to learn more about EMC & RF testing? Read our Radio Equipment Directive Greenpaper or get in touch with one of our experts.